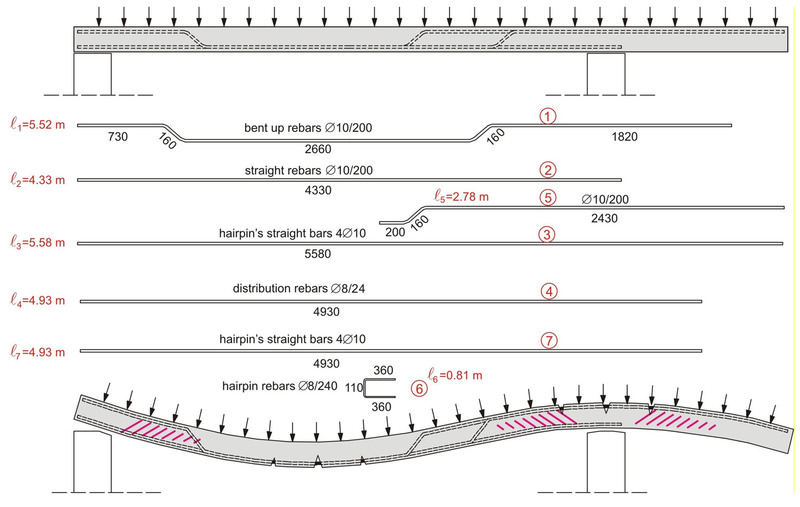 The behavior and the reinforcement of a one-way slab connected to a cantilever are described below. If the first slab is a two-way slab both the behavior and the reinforcement rules are ana-logous. One-way slab connected to a cantilever "project: slabs30"
The bars shown at this example constitute the primary and the secondary reinforcement re-quired by the static calculations. They are placed in parts of the lower and upper slab surfaces and they secure the structure’s strength against the primary loads defined by the regulations. However, apart from the primary loads there often are incalculable loads that cause less in-tense, secondary stresses. These are successfully carried in areas with reinforcement while in all other areas they cause the formation of cracks. These type of stresses, except from con-crete’s drying shrinkage, are differential deformations caused by sudden differential stressing, e.g. the placement of building materials upon a part of a slab, mainly though they are deforma-tions caused by earthquake forces. The cracking does not affect the structure’s strength but it arises serviceability and aesthetic issues. The cracking’s control can be achieved by an addi-tional light coherence reinforcement [*] NoteThe coherence reinforcement is analogous to the surface reinforcement which is required by all regulations only for cracking prevention, when due to adverse environmental conditions present throughout the structure’s service life, there is a large reinforcement cover depth. placed at the lower and upper slabs’ surfaces in the ar-eas that remain unreinforced. In the upper floor slabs and generally, during the construction stage, in all weather-exposed slabs it is almost mandatory to place a light wire mesh so as to avoid the cracking caused main-ly due to the weather conditions present throughout the building’s construction. The coherence reinforcement is provided by a light industrial wire fabric reinforcement e.g. 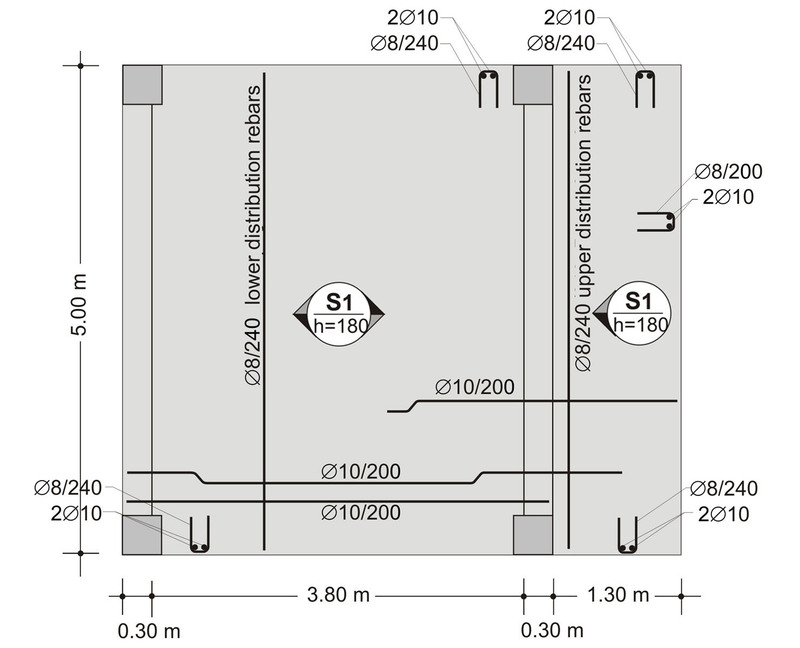 Τ131, placed at the lower surface of the cantilever slabs and at the upper part of the slabs’ span which does not have primary reinforcement, as shown at the above figure. The coherence reinforcement’s cover depth is secured as shown also in § 2.6.1.